For the moment, however, we will glimpse the art of British artists, some of whom had been or were members of the Arts and Crafts movement (1890 – 1920) or had benefited from the broadening of objects and styles considered artistic introduced by the Pre-Raphaelite Brotherhood, founded in 1848. The Pre-Raphaelite Brotherhood conferred acceptability to areas of the visual arts that had seemed marginal in earlier years, such as history painting and the illustration of books, children’s literature especially, and artwork that was reproduced, or prints. Such movements broke with the constraints of academic painting and introduced a democratization of art. The “beautiful” could be found in a piece of textile or wallpaper, the decoration of a room, or to put it in a nutshell: design. Given the breadth of this subject, I will show art by Walter Crane, Arthur Rackham and Sir John Tenniel. This particular post is an illustrated introduction. They are also listed at the foot of this post. 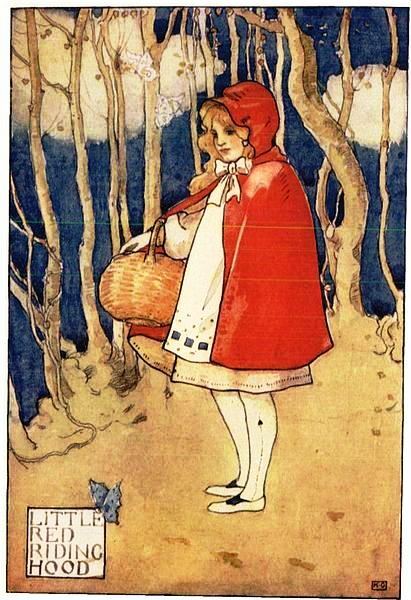 As it flourished, the illustration of children’s literature reflected a major transformation. Childhood was not born until recently, which can be explained, at least in part, by the high mortality rate among children. Too few reached adulthood. Besides, children’s literature had been put into the service of education. It was didactic and moralistic, or so people thought. (See Philippe Ariès and Centuries of Childhood, Wikipedia.) It was as though children were born tainted with the original sin, a condition baptism did not correct fully. In literature, Æsopic fables flourished long before Beatrix Potter (Peter Rabbit). There are several illustrators of Æsopic fables who are also, to a large extent, illustrators of Jean de La Fontaine. Jean de La Fontaine retold a large number of Æsopic fables that had been taken away from the realm of oral tradition beginning with Latin author Phædrus (1st century CE) and Greek author Babrius (2nd century CE). (See Phædrus [fabulist], Wikipedia.) These were supposedly didactic, but the Horatian ideal, to inform and to delight, was not always served. Children were delighted and did not necessarily identify with the careless behaviour of a mere grasshopper. The tale was not about the behaviour of children; it was about the behaviour of a grasshopper. Children knew the difference. Illustrations have solid roots in Western culture. Jean de France, duc de Berry paid a fortune for his illustrated Très Riches Heures. But it could well be that Japonism triggered the British Golden Age of illustration and its large European counterpart. Japan had isolated itself in the 17th century (1633–39). No one could enter or leave Japan under penalty of death. That period of Japan’s history is called the Sakoku period, which ended in 1853 with the forcible entry of the Black Ships of Commodore Matthew Perry. However, as of 1860, Europe was flooded with Japanese prints. As prints, these were not the unique works of art Europeans created (beginning with the 8th-century Book of Kells). After the invention the printing press, certain books were still illuminated by hand. But, as of 1501, printers no longer left room on a page for an illustrator to illuminate a printed text. The hand-painted printed books produced during the period that spans the invention of printing and the demise of hand-painted books are called incunabula (les incunables). Contrary to Europeans, the Japanese printed their artwork and these were considered by Europeans to be genuine artwork, despite duplication. Even Vincent van Gogh could afford a Japanese print of which he liked both the style and the subject matter. He did not learn a printing technique, but Henri de Toulouse-Lautrec and Mary Cassatt did. Art had become affordable and it spread to design, to use a broad term. Moreover, certain artists’ Japonism consisted in including the objects of the Orient in their paintings: white and blue porcelain, fans, screens… Many artists also liked the beau idéal Japan proposed. Ironically, appreciation of Japan’s beau idéal contributed to the emergence of Art Nouveau, Art Deco and, eventually, modernism. Art Nouveau flourished during the golden years of illustration. However, the most significant element Japonism brought to European art was an acceptance of art reproduced: prints. Japanese artists reproduced their art, called ukiyo-e, using wood block printing. Consequently, they did not adhere to the notion that a work of art should be unique and original. Apprenticeship consisted in attempting to master the art of one’s master. For Japanese artists, beauty was not a matter of taste. They supported the concept of a beau idéal, which meant that, in their eyes, beauty was one of a kind, but not the artwork. It is in this respect, the acceptability of prints, that Japonism paved the way for the golden age of illustrations (see Illustration, Wikipedia). Many of us do purchase original art, but a reproduction can provide the same pleasure as the original. Such is the case of my beloved Child Händel. It is an inexpensive copy of a painting by Margaret Isabel Dicksee, but I like it. So did Walter Shaw Sparrow and Ralph Peacock who either compiled, the former, or, the latter, wrote a chapter of Women Painters of the World (Gutenberg [EBook #39000]). As it happens, a poster by Toulouse-Lautrec may cost millions. Several copies were made, but few are available and the art of Toulouse-Lautrec is considered beautiful by a large number of art lovers. Although beauty is in the eye of the beholder, there is a significant degree of unanimity with respect to the beauty of certain works of art. Pioneers of “copied” art are John Leech (Punch), George Cruikshank (illustrator &c), Hablot Knight Browne (Dickens‘ illustrator), Honoré Daumier (French caricaturist), George du Maurier (cartoonist) and others. However, we are beginning with John Tenniel, Arthur Rackham and Walter Crane. 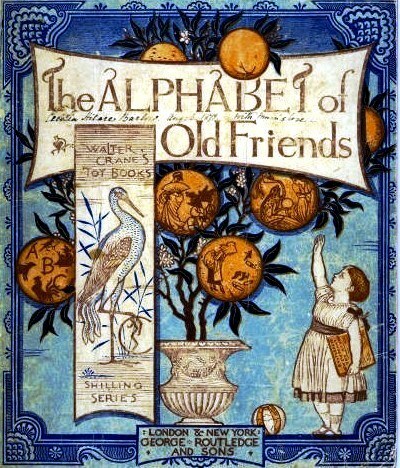 Walter Crane illustrated The Baby’s own Æsop. (See Gutenberg [EBook #25433] and Laura Gibbs’ mythfolklore.net.aesopica). Early illustrations were not coloured. Gustave Doré‘s, illustration of La Fontaine are monochrome pieces. Prints, such as the oriental prints that flooded Europe after the Sakoku period, could be coloured, in which they differed substantially from monochrome prints. 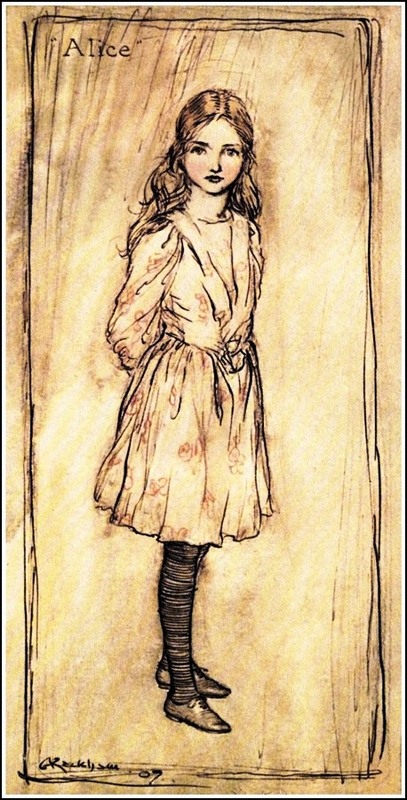 Both Arthur Rackham and Sir John Tenniel produced monochrome as well as coloured illustrations and both illustrated Lewis Carroll‘s Alice’s Adventures in Wonderland. They and Walter Crane are our artists, as space and the nature of weblogs do not allow me to feature Beatrix Potter—who illustrated the books she wrote, the Peter Rabbit stories, Kate Greenaway, and others. All are listed at the foot of this post. Pictures can be found by clicking on the name of the artist. Their work may also be seen at Wikimedia.org. Write the name of the artist and specify Wikimedia.org. However, the art of other illustrators may be shown in future posts. Walter Crane was influenced by Japanese colour-prints (see Walter Crane, Wikipedia). As for Sir John Tenniel, he drew his illustrations which were then engraved by the Brothers Dalziel. (See Sir John Tenniel, Wikipedia.) 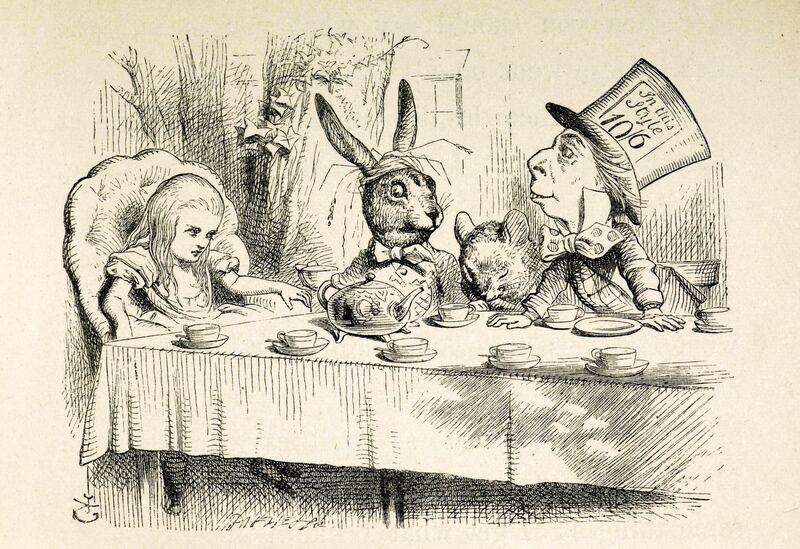 Sir John Tenniel’s illustrations for Alice in Wonderland are a Gutenberg [EBook #114] publication. 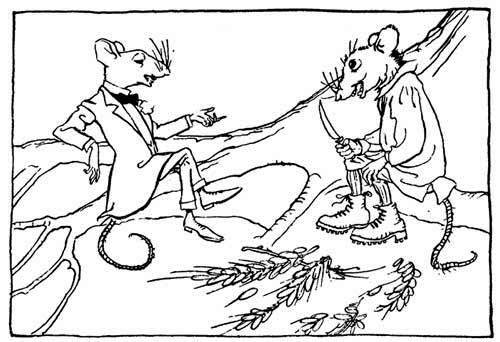 Sir John Tenniel engaged in nonsense art and Lewis Carroll, in literary nonsense, but Carroll did not write limericks. Nonsense is an umbrella term and, although limericks can be used in children’s literature, they may be not suitable for children. Unlike Walter Crane’s The Baby’s own Æsop, “Hercules and the Waggoner” a fable by Æsop and La Fontaine, and Rudyard Kipling’s “Small boy of Quebec,” which is witty and delightfully naïve, limericks may be crude. But Walter Crane produced Toy Books inspired by Japanese art. I must close this very incomplete post, but we have seen a significant expansion of the areas that could be considered legitimate art, from illustrations to design. Japonism played a role in this expansion and it also played a role in a democratization of art as did the Arts and Crafts movement.